This morning in Huntington at 7:50AM it’s currently 66 degrees under mostly cloudy skies. Winds are calm. Relative humidity is 99%, dewpoint 65, barometric pressure 29.76″ and rising. We picked up 0.21″ of rain in the past 24hrs. Yesterday’s high was 80, and the overnight low was 60. I’d love to report that there’s a change in the weather pattern, but it just ain’t true… We’ll see mostly cloudy skies with patchy fog this morning. Showers and thunderstorms are likely this afternoon as a short wave trough moves through the region and interacts with diurnal heating. Highs will be in the upper 70s with light and variable winds. Chance of rain is 70%. Tonight should be cloudy with a chance of showers and a slight chance of thunderstorms until midnight. Lows will be in the lower 60s with light and variable winds. Chance of rain is 50%. Monday should be cloudy with a chance of showers in the morning, then showers likely with a chance of thunderstorms in the afternoon. Highs will be in the upper 70s with light and variable winds. Chance of rain is 60%. Monday night showers are likely with a chance of thunderstorms. Lows will be in the lower 60s with light and variable winds. Chance of rain is 60%. More short wave activity and deeper moisture will arrive on Tuesday bringing showers and thunderstorms. With higher moisture contents, there’s the possibility of more flooding Tuesday. Highs will be around 80 with light and variable winds. Chance of rain is 70%. Tuesday night showers and thunderstorms are likely. Lows will be in the mid 60s. Chance of rain is 70%. Last year on this date we had a high of 86 and a low of 55. Burlington norms for this date are highs of 80°F and lows of 59°F. Record low was 42°F 1936. The Moon is in its last quarter, 21d 20h old with 47% illumination. 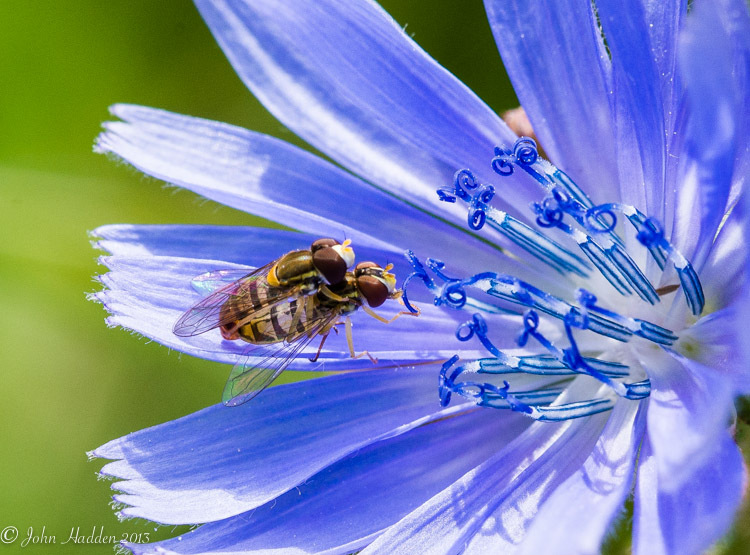 The chicory is blooming along roadsides and in meadow and fields this time of year. I love the different shades of blue that chicory can have, from pale to deep. I was out shooting some of the blossoms yesterday when I came across this pair “busy” feeding and doing their thing. They were pretty small, and I didn’t realize that there were two of them until I focussed in close. Photo Info: Nikon D600, Sigma 105mm lens, ISO 800, f/13, 1/640″. A brilliant orange and yellow nasturtium peeks out from behind its leaves. This morning in Huntington at 7:30AM it’s currently 63 degrees under mostly cloudy skies. Winds are calm. Relative humidity is 98%, dewpoint 62, barometric pressure 29.51″ and rising. We picked up 0.15″ of rain in the past 24hrs. Yesterday’s high was 76, and the overnight low was 61. With the Bermuda high still anchored out in the eastern Atlantic and a deep trough over the Midwest, we’ll continue to see warm and humid condition with afternoon showers right into next week. Today we’ll see cloudy skies with a chance of showers this morning, then showers and thunderstorms likely this afternoon as diurnal heating does its thing. Highs will be in the upper 70s with light and variable winds, becoming southerly around 10 mph this afternoon. Chance of rain is 60%. Tonight should be mostly cloudy with a chance of showers and thunderstorms until midnight. Lows will be in the upper 50s with south winds around 10 mph until midnight, becoming light and variable. Chance of rain is 40%. Sunday should be mostly cloudy with a slight chance of showers in the morning, then a chance of showers and thunderstorms in the afternoon. Highs will be around 80 with light and variable winds. Chance of rain is 50%. Sunday night should be cloudy with a chance of showers and thunderstorms. Lows will be in the lower 60s with light and variable winds. Chance of rain is 40%. Monday showers and thunderstorms are likely. Highs will be in the lower 80s with light and variable winds. Chance of rain is 60%. Monday night showers are likely with a chance of thunderstorms. Lows will be in the mid 60s. Chance of rain is 60%. Last year on this date we had a high of 87 and a low of 54. We picked up 0.03″ of rain. Tomorrow will be 0m 38s shorter. The Moon is waning gibbous, 20d 19h old with 58% illumination. 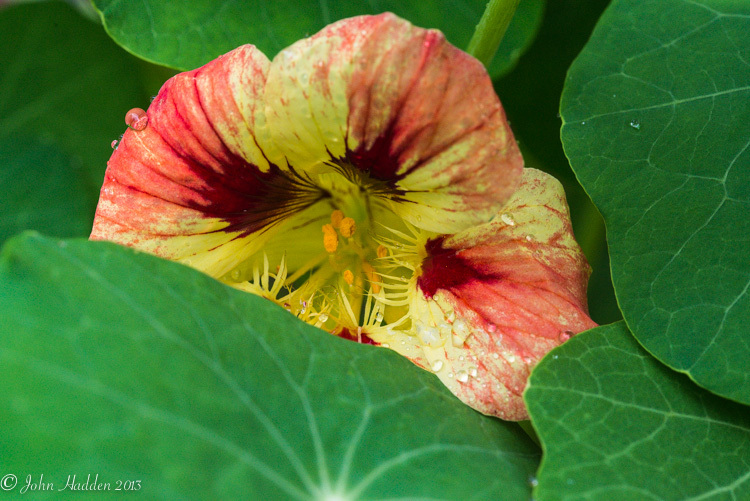 This lovely nasturtium is growing just below our back deck. I got the shot during a brief interval of not-raining yesterday afternoon. I particularly like the single rain drop on the upper left petal. Photo Info: Nikon D600, Sigma 105mm lens, ISO 2000, f/14, 1/125″. If you like the photos you’re seeing here, I invite you to visit my photo blog: John Hadden Photography. Lots more images there! 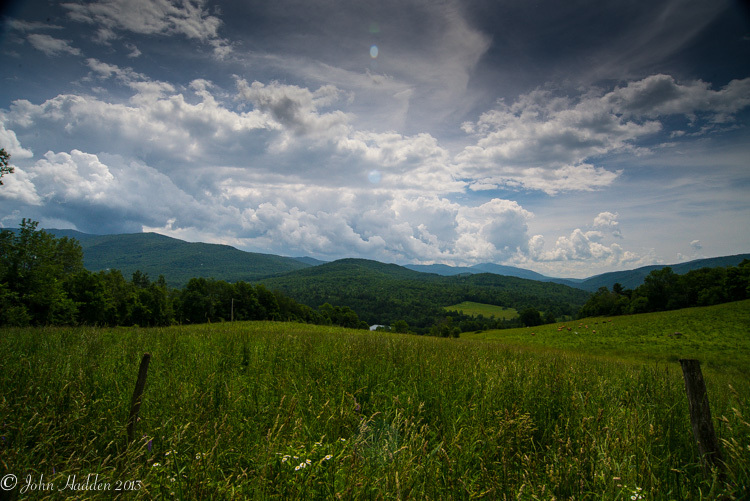 Cumulus congestus clouds build up in the midday sky over the Green Mountains in this view from the top of Taft Hill. This morning in Huntington at 6:55AM it’s currently 64 degrees and raining lightly under overcast skies. Winds are out of the west at 0-3 mph. Relative humidity is 95%, dewpoint 63, barometric pressure 29.46″ and falling rapidly. We picked up 0.41″ of rain overnight. Yesterday’s high was 84 and the overnight low was 64. Morning radar imagery shows a large gyre of rain pivoting around a low pressure system centered over eastern New York. The Areal Flood Watch is still in effect for our area until this evening. With low pressure moving northward through eastern New York this morning, we’ll see more rain this morning, then occasional showers this afternoon. Rain may be heavy at times this morning, though it’s looking like the heaviest rains should be west of us in the ‘Dacks. Highs will be in the lower 70s with northeast winds 10 to 15 mph this morning, becoming light and variable. Chance of rain is near 100%. Tonight should be cloudy with showers likely. Lows will be in the lower 60s with light and variable winds. Chance of rain is 60%. Saturday should be cloudy with a chance of showers in the morning, then showers and thunderstorms likely in the afternoon. Highs will be in the upper 70s with light and variable winds, becoming southwesterly 10 to 15 mph in the afternoon. Chance of rain is 60%. Saturday night should be mostly cloudy with a chance of showers and thunderstorms. Lows will be in the lower 60s with southwest winds 10 to 15 mph. Chance of rain is 40%. Sunday’s looking mostly cloudy with a chance of showers and thunderstorms, especially in the afternoon. Highs will be in the upper 70s with light and variable winds. Chance of rain is 50%. Sunday night should be partly cloudy with a chance of showers and thunderstorms. Lows will be in the lower 60s. Chance of rain is 40%. Last year on this date we had a high of 80 and a low of 55. We picked up 0.36″ of rain. Tomorrow will be 0m 35s shorter. The Moon is waning gibbous, 19d 19h old with 68% illumination. With the warm and humid weather of recent days (weeks?) we’ve seen lots of these kind of cumulus congestus clouds building as daytime heating pushes up piles over the higher terrain. This sort of cloud will often build into cumulonimbus clouds that produce rain and thunderstorms. A dramatic sky! Photo Info: Nikon D600, Nikon 18-35mm lens at 35mm, polarizing filter, ISO 800, f/14, 1/400″. 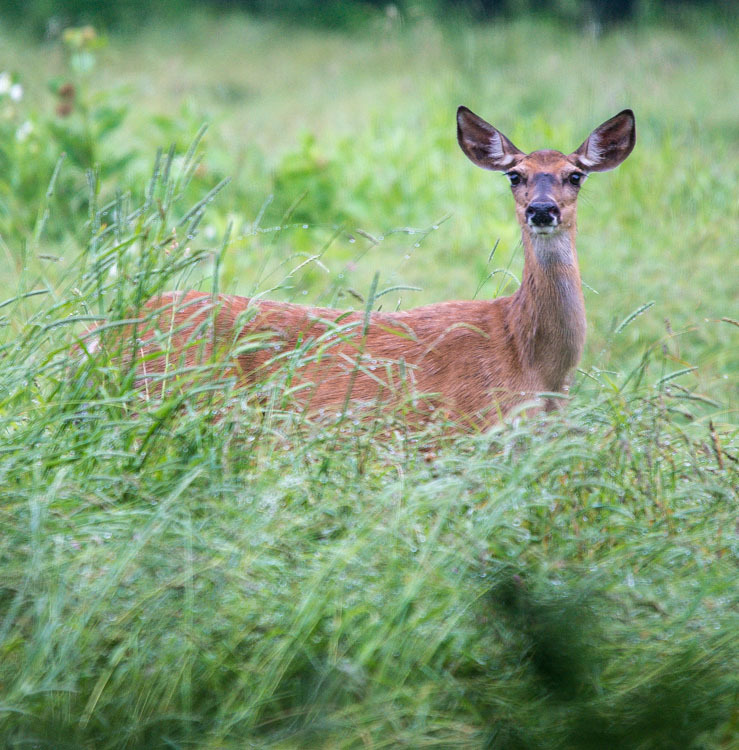 A white tail doe on alert in the hay field along Camel’s Hump Road yesterday morning. This morning in Huntington at 6:20AM it’s currently 62 degrees under mostly clear skies. Winds are calm. Relative humidity is 99%, dewpoint 61, barometric pressure 29.76″. We picked up 0.50″ of rain in the past 24hrs. Yesterday’s high was 77 and the overnight low was 61. There is an Areal Flood Watch in effect for our region from this evening until Friday evening. More from the broken record department: Today we’ll see partly sunny skies with a chance of showers and thunderstorms this afternoon. Some thunderstorms may produce heavy rainfall this afternoon. Highs will be around 80 with light and variable winds. Chance of rain is 40%. Low pressure currently out over Pennsylvania will push into the region tonight producing more showers and thunderstorms and heavy rainfall right into Friday. Overnight lows will be in the mid 60s with southeast winds around 10 mph. Chance of rain is 90%. Friday will bring more heavy rain in the morning, then occasional showers in the afternoon. Highs will be in the lower 70s with east winds around 10 mph. Chance of rain is 90%. There is quite a lot of moisture in this low pressure system, and we can expect as much as 2.5″ to 3″ total before things taper off mid-day Friday. 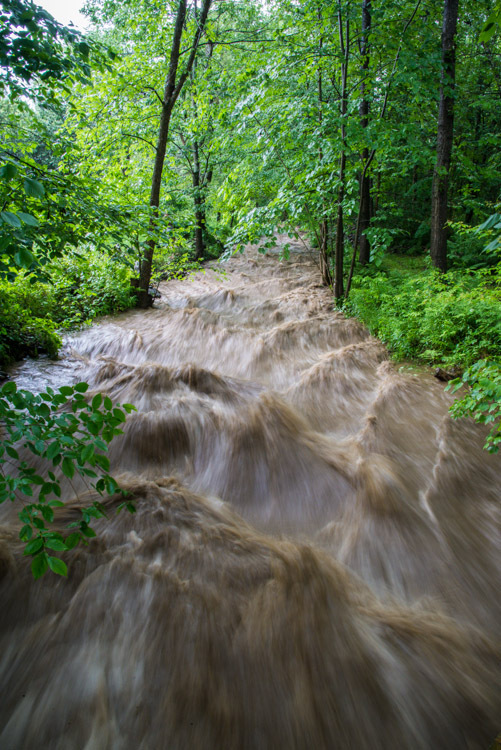 Some areas may see as much as 4″, so keep the hip waders handy and be aware of flooding if you live near rivers and streams! Friday night should be cloudy with a 50% chance of showers. Lows will be in the lower 60s with southeast winds around 10 mph. The rainy, muggy pattern will continue into Saturday (and honestly, it’s looking like straight through next week…) with showers likely. Highs will be in the upper 70s with south winds 10 to 15 mph. Chance of rain is 60%. Saturday night should be cloudy with a chance of showers. Lows will be in the lower 60s. Chance of rain is 50%. Last year on this date we had a high of 63 and a low of 56. We picked up 1.62″ of rain. Burlington norms for this date are highs of 79°F and lows of 59°F. Record high was 96°F in 1999 (we had a high of 88). Record low was 44°F in 1927. Tomorrow will be 0m 30s shorter. Moon is waning gibbous, 18d 18h old with 79% illumination. I was on my way to a gig yesterday morning when this white tail doe bounded across Camel’s Hump Road in front of me and then stopped out in the hay field. I stopped my car wondering, will she wait long enough for me to get my telephoto lens on my camera? Well, she did, and very patiently at that! I was able to rattle off quite a few frames before another passing care shooed her away. Shot Info: Nikon D600, Sigma 120-400mm lens @ 400mm. ISO 1000, f/5.6, 1/500″. I’ve launched a new photography website/blog! I know a lot of you enjoy my photography, and I felt a need to have an avenue to show more of the work that I’m doing. You can find my new site here: John Hadden Photography. It’s a little bare bones just now, but I aim to post daily. I hope you take a look, like it, and subscribe! 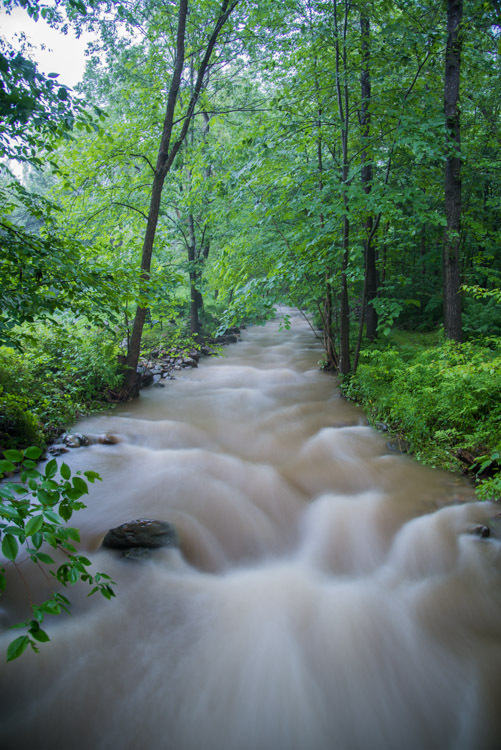 Fargo Brook rages shortly after the rains–about 1.25″ in 30 minutes–let up briefly yesterday afternoon at around 4:30PM. This morning in Huntington at 6:00AM it’s currently 63 degrees under overcasts skies. Winds are calm. Relative humidity is 99%, dewpoint 62, barometric pressure 29.73″. We picked up 1.59″ of rain yesterday, most of it 40 minute period starting around 3:30PM. Yesterday’s high was 86, and the overnight low was 62. The Bermuda high off the Atlantic coast will continue to pump warm, moist sub-tropical air into the region through the weekend. At the risk of sounding like a broken record, we’ll be seeing the same cycle of soggy, foggy mornings with the likelihood of afternoon thunderstorms clear into the weekend, though temperatures should moderate a bit by the end of the week. Today will be cloudy with showers and thunderstorms likely, mainly this afternoon. Some thunderstorms may produce heavy rainfall this afternoon, though they should not be as violent as yesterday’s storms given that we’ll see more cloud cover during the day, and that will limit diurnal heating. Highs today will be in the lower 80s with light and variable winds. Chance of rain is 70%. Tonight should be partly cloudy with a chance of showers and thunderstorms until midnight. Lows will be in the mid 60s with light and variable winds, becoming southerly around 10 mph after midnight. Chance of rain is 40%. Thursday should be partly sunny with patchy fog in the morning and a chance of showers and thunderstorms in the afternoon. Highs will be around 80 with south winds around 10 mph in the morning, becoming light and variable. Chance of rain is 30%. Thursday night showers and thunderstorms are likely as a more vigorous shortwave disturbance will lift northeast into the region. Some thunderstorms may produce heavy rainfall. Lows will be in the mid 60s with southeast winds 10 to 15 mph. Chance of rain is 90%. Friday will bring more showers and thunderstorms with some thunderstorms again producing heavy rainfall. Highs will be in the mid 70s with east winds 10 to 15 mph. Chance of rain is 90%. Friday night showers are likely with a chance of thunderstorms. Lows will be in the lower 60s. Chance of rain is 70%. Last year on this date we had a high of 57 and a low of 52. We picked up 0.49″ of rain. Record high was 96°F in 2007 (we had a high of 92). Tomorrow will be 0m 26s shorter. The Moon is waning gibbous, 17d 18h old with 87% illumination. It’s a two-fer today! I took the shot above at around 4:30PM after the downpour had subsided a bit. Fargo Brook was close to jumping its banks, and the view from our new bridge was invigorating to say the least! There was maybe 3″ of clearance under the bridge. The second shot (below) was taken near dusk at around 8:40PM. You can see that the water level has dropped at least a foot. I used two different shutter speeds for the two photos: 1/8″ for the first and 5″ for the second. I like the effect of both. Photo info: (top) Nikon D600, Nikon 24-120mm @ 24mm, ISO 1000, f/22, 1/8″ hand-held; (bottom) Nikon D600, Nikon 24-120mm @ 24mm, ISO 100, f/4.5, 5 second exposure, tripod mounted. Last night’s full moon peeks out from behind fast moving clouds. This morning in Huntington at 6:10AM it’s currently 64 degrees under partly cloudy skies. Winds are calm. Relative humidity is 99%, dewpoint 63, barometric pressure 29.94″. We picked up 0.55″ of rain yesterday, mostly in the form of one strong thunderstorm that rolled through at around 3:00PM. Yesterday’s high was 83 and the overnight low was 63. It’ll be another warm and muggy day to start the work week as the north country remains under the influence of a Bermuda high parked off the Atlantic coast. We’ll see partly sunny skies with patchy fog this morning, then scattered showers and thunderstorms this afternoon. Some thunderstorms may produce gusty winds, small hail and heavy rainfall. Highs will be in the mid 80s with southwest winds around 10 mph, becoming westerly this afternoon. Chance of rain is 50%. Tonight should be partly cloudy with scattered showers and thunderstorms, mainly until midnight. Lows will be in the mid 60s with southwest winds around 10 mph until midnight, becoming light and variable. Chance of rain is 40%. Rinse and repeat for Tuesday with partly sunny skies and scattered afternoon showers and thunderstorms. Highs will again be in the mid 80s with southwest winds around 10 mph, becoming westerly in the afternoon. Chance of rain is 50%. Tuesday night should be mostly cloudy with scattered showers and thunderstorms. Lows will be in the mid 60s with southwest winds around 10 mph. Chance of rain is 40%. Aaand again on Wednesday we’ll see partly sunny skies with scattered afternoon showers and thunderstorms. Highs will be in the lower 80s with light and variable winds. Chance of rain is 50%. Wednesday night should be partly cloudy with a chance of showers and thunderstorms. Lows will be in the mid 60s. Chance of rain is 50%. Last year on this date we had a high of 81 and a low of 48. Record high was 96°F in 2003 (we had a high of 92). Tomorrow will be 0m 17s shorter. The Moon is waning gibbous, 15d 18h old with 99% illumination. This was a very challenging photo to take, and I learned a lot from the close-to-failed experience… We walked up to a neighbor’s field that had a good view of the eastern horizon along the spine of the Greens (thanks J&E!) and waited patiently for the moon to rise, hoping that there would be a break in the fast moving clouds that were cruising in from the west. The first thing that I realized (as the mosquitos were biting) was that I’d forgotten the ball-head mount for my tripod. Doh! So framing the shot was a study in frustration as I had to adjust the legs of the tripod on uneven ground. As the clouds broke very briefly, I was able to shoot only a few frames–mostly overexposed on the moon robbing it of much of any detail. It was only by tweaking it in Lightroom later that I was able to tease out any surface detail. Lessons learned: higher ISO, shorter exposure time, and spot metering on the moon itself. And bring the ball-head! Still, I like how the clouds are blurred a bit and the overall effect of the photo is kind of cool. Shot Info: Nikon D600, Sigma 120-400mm @ 300mm, ISO 1000, f/10, 1.6″ exposure. English daisies and grasses suspended over our pond. This morning in Huntington at 7:30AM it’s a damp and muggy 68 degrees under partly cloudy skies. Winds are calm. Relative humidity is 99%, dewpoint 68, barometric pressure 30.06″ and rising. We picked up 0.34″ of rain overnight. Yesterday’s high was 79, and the overnight low was 64. The Bermuda high now anchored in the Atlantic will set us up for a fairly stagnant weather pattern for the upcoming week as it helps to funnel warm, tropical air into the region. We’ll see hot, muggy days and the daily threat of thunderstorms as daytime heating interacts with a series of shortwave disturbance moving eastwardly. Today we’ll see cloudy skies with a slight chance of showers with isolated thunderstorms this morning, then partly sunny skies with scattered showers and thunderstorms this afternoon. Some thunderstorms may produce heavy rainfall this afternoon. Highs will be in the lower 80s with light and variable winds, becoming southwesterly around 10 mph this afternoon. Chance of rain is 30%. Tonight should be partly cloudy with scattered showers and thunderstorms until midnight, then mostly cloudy with isolated showers and thunderstorms after midnight. It’ll be humid with lows in the mid 60s and light and variable winds. Chance of rain is 30%. Monday should be mostly cloudy with scattered showers and thunderstorms, mainly in the afternoon. Highs will be in the lower 80s with southwest winds around 10 mph. Chance of rain is 40%. Monday night should be partly cloudy with scattered showers and thunderstorms. Lows will be in the lower 60s with southwest winds around 10 mph. Chance of rain is 30%. Tuesday’s looking partly sunny with a chance of showers and thunderstorms, again in the afternoon hours. Highs will be in the mid 80s with southwest winds around 10 mph. Chance of rain is 40%. Tuesday night should be partly cloudy with a chance of showers and thunderstorms. Lows will be in the lower 60s. Chance of rain is 40%. Last year on this date we had a high of 76 and a low of 51. Tomorrow will be 0m 13s shorter. The Moon is the full Strawberry Moon (Northeast Native American), 14d 19h old with 100% illumination. 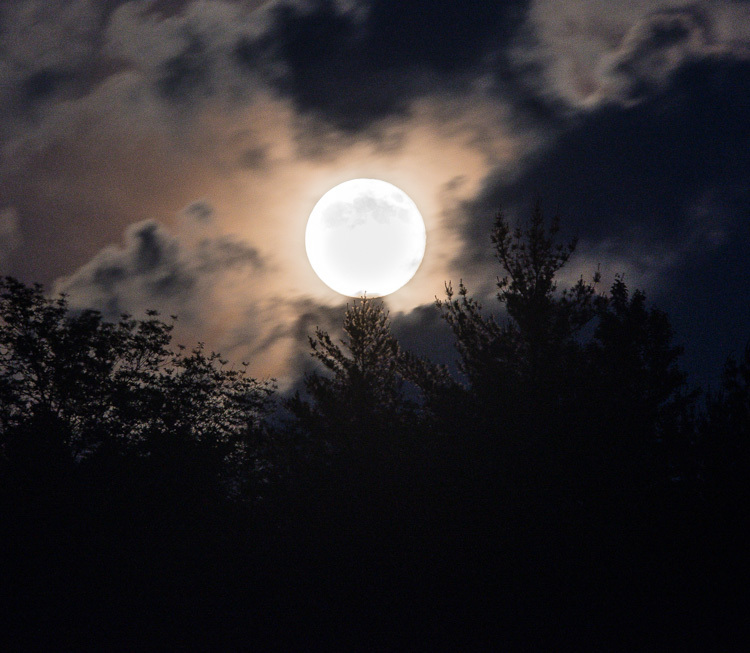 Other names for this full moon include: “Rose” (Colonial American), “Flower” (English), “Horses” (Celtic), “Dyad” (Medieval Wiccan), and “Planting” (Neo Pagan Wiccan). This full moon is also what’s been termed a “Supermoon”, as the moon is at perigee (its closest approach to the earth in its elliptical orbit) and will appear about 14% larger than other full moons. Astronomers call this type moon a “perigee full moon.” The term “Supermoon” is of recent coinage–being used for the first time to describe the perigee full moon of 2011. The term is linked to astrology and has been used to prognosticate all kinds of dire events such as earthquakes, floods, and volcanic eruptions. There’s are good articles on the matter here and here. If the skies are clear at moonrise, it might be worth a look at the eastern horizon as it should be quite lovely! 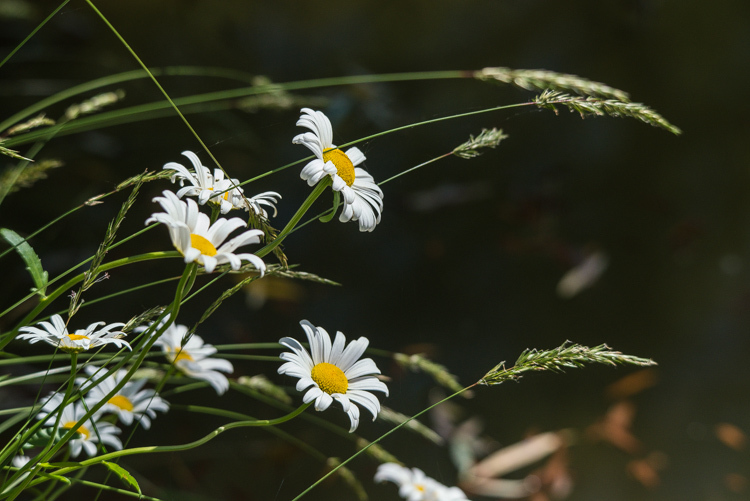 Here’s a telephoto shot of English daisies and grasses seemingly suspended in space above the waters of our pond. I like the way the flattened depth of field helps to isolate the subject (the two in-focus daisies) and blurs the background smoothly. The shot was taken with my D600, Sigma 120-400mm lens @ 185mm, ISO 800, f/8, 1/1600″.